Creationism is for the most ignorant people in society. The most gullible people. With all Science and Technology has told/showed us the last 50 years it makes it even more ignorant. If slightly different creatures *couldn't* interbreed, then evolution would have a problem. Darwin is my god and we have done all we can to limit his power in the modern era. It truly is a shame. Natural selection is king. Let it run free. Let it cleanse the world of idiocy. Micro evolution vs macro evolution needs to be pointed out. Micro evolution are small changes in a species to adapt to different conditions. Those have been observed, and nearly all intelligent design proponents would not argue against micro evolution. But macro evolution is positing something we haven't observed and that seems extreme... certain species developing totally new organs as a kind of mutation (mutations are typically a bad thing). The problem is waved off by giving enough time, but our fossil records don't show evidence for those kinds of mutations. Doesn't mean they are definitely wrong, but the concrete evidence is not there. A PPP survey conducted in 2015 found that 49% of Republicans reject evolution completely, while 37% do not. Now I'm supportive of many aspects of evolution, but not completely, especially in regard to humans. No one has ever seen one creature evolve into something else, nor will they. The amount of upvotes to downvotes on that post show how stupid this board is as a whole. But macro evolution is positing something we haven't observed and that seems extreme. Well. Ya know. Other than the fact that there are Dinosaurs in the fossil record billions of years ago, but no humans(along with thousands of other species). Please tell me you don't do anything more than driving a forklift. Sweet Christ there are some dumb mother frickers that post here. A PPP survey conducted in 2015 found that 49% of Republicans reject evolution completely, while 37% do not. Now I'm supportive of many aspects of evolution, but not completely, especially in regard to humans. The irony of course being that republicans favor a system which seems, for the most part, to embrace the fundamental forces of Darwinism while progs seek to undermine it at virtually every opportunity. Affirmative action being a good example. Creationism is for the most ignorant people in society. ID in a nutshell (emphasis on nut): Life is so biologically complex that it couldn’t have hapoened randomly. 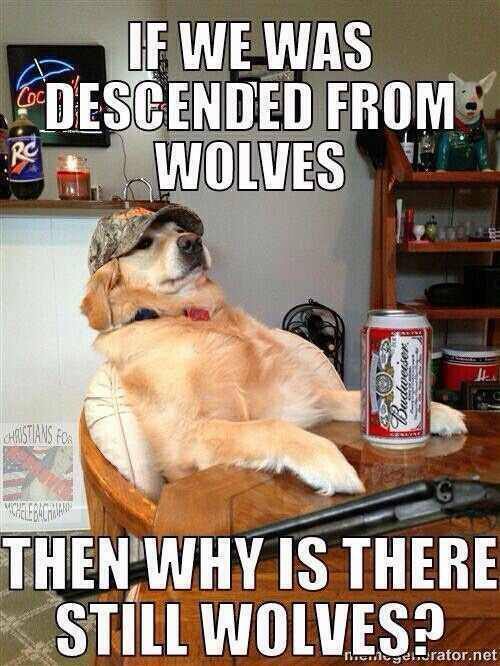 Funny meme, but "descended from" and specifically bred are 2 different situations. Who thinks that a pug is the result of natural selection? We see viruses and bacteria evolve all the time. The same mutations give them selective advantages for survival. It's why developing vaccines for some viruses is a challenge. Like horses and mules, lions and tigers, or camels and llamas? That kind of thing? They are very simple creatures. Life is so biologically complex that it couldn’t have hapoened randomly.